Roasted veggies, we all need to eat our vegetables, so at least they should be yummy. You can choose any vegetable you like and fix this with only one or a mixture of veggies. We really like a mixture. To start clean all your vegetables and chop them up. It is better to leave them in a slightly bigger bite sized piece when chopping, otherwise they get mushy when you roast them and that's not what you want-Yuck! So, clean, chop and put in a large bowl and toss with olive oil and seasoning. Mix Equal Parts with the exception of the red and black pepper ( i usually use less in order for it not to be to spicy). Ok, your vegetables are in a bowl coated with olive oil and now you can sprinkle the seasoning over the vegetables and toss again. The amount of seasoning depends on how much you would like, I would start off my first batch with going easy on the seasoning. 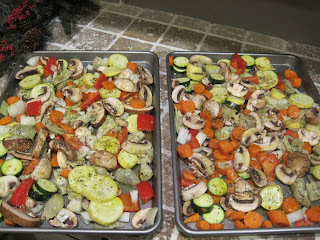 Pour vegetables on to a baking sheet (or two) and put in the oven on 375 - 400 degrees for 15 to 20 minutes. The amount of time depending on how tender you prefer your vegetables. Serve and Enjoy. 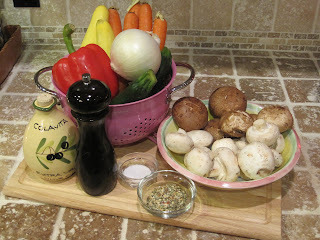 When deciding which vegetables to use try all kinds, Brussel sprouts (cut them in half) are a great addition, artichoke hearts, parsnips, red bell peppers, different variety of mushrooms, really just about anything. Let me know how it goes. Tikaa, This sounds wonderful. I am going to try it. Thanks for showing us.